Take Interstate 94 east to Highway 61 south (exits just past downtown St. Paul). Follow 61 south through Hastings and Miesville into Red Wing. Just as you are coming into downtown, turn right on West Avenue (a one-way going up the hill). West Ave takes you past the post office, courthouse, and many of Red Wing’s historic churches. At the top of the hill, you will come to a five-way intersection, turn right up the very steep hill (this is College Avenue). At the top of the hill, College will curve right and turn into Oak Street. Follow approximately two more blocks. The History Center is on the right-hand side, a large red brick building. Oak Street ends at the museum intersection. Take U.S. Highway 52 north to Zumbrota. At Zumbrota, take Highway 58 north to Red Wing. Approximately 1/2 mile after Highway 58 becomes Bush Street, turn left on Seventh Street. After four blocks, Seventh becomes College Avenue. Continue straight up the hill (divided road). At the top of the hill, College will curve right and turn into Oak Street. Follow approximately two more blocks. 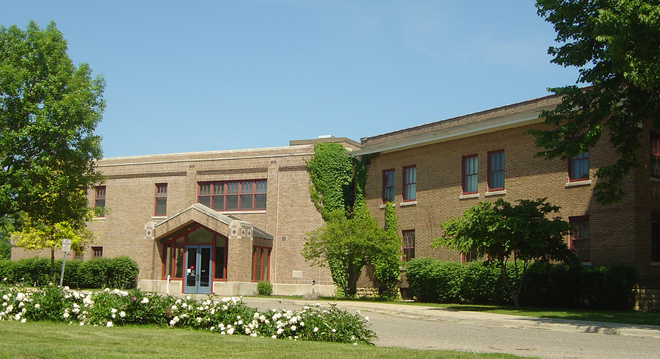 The History Center is on the right-hand side, a large red brick building. Oak Street ends at the museum intersection.